The Race HQ is Kingsway Youth Club, Kingsway, Wellingborough. Refreshments available after the race in the HQ. Car parking is is limited, there are a few small car parks around the Park, parking is allowed on the local streets, but please remember to car share. 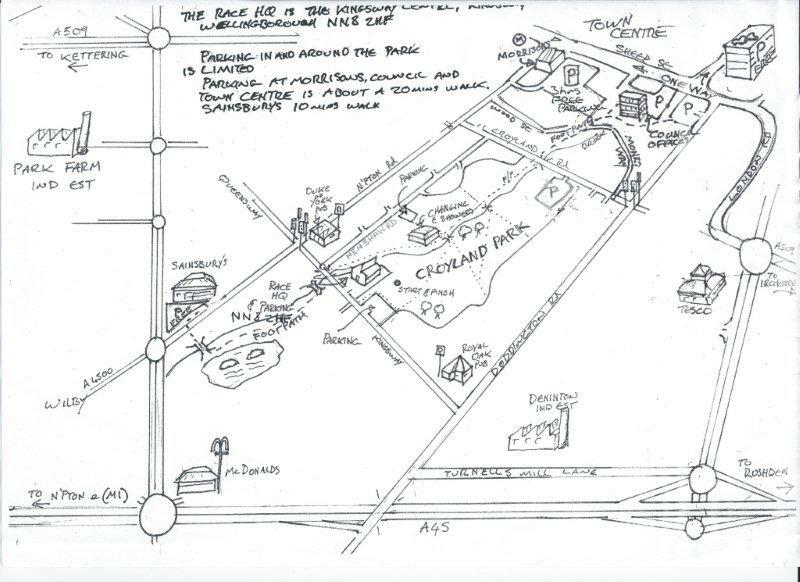 The drawing shown here shows the extra parking places around Croyland Park. There are no toilet or changing facilities in the HQ. Changing, showers & toilets are in a separate area; about 5 minutes walk from the HQ. No valuables must be left in the changing rooms during the race, as they are NOT LOCKED UP. The start & finish are only 1 min from the HQ. The total course is 8.34 Km.